Judy Nunn and Charlie Robinson celebrated as Robinson won at a slot machine at the Plainridge Park Casino on Monday. PLAINVILLE — Mike Umbruglia may be the first person to lose $100 in one pull of the lever of a high-stakes slot machine at a Massachusetts casino, but he is not complaining. Umbruglia and three buddies arrived at Plainridge Park Casino, the state’s first casino, just as the doors opened on Monday. They were among several thousand people invited by the casino operator to play for real as a test of the casino’s equipment and protocols two days before its scheduled opening to the public on Wednesday. “Wow, that was quick,” Umbruglia said after taking a chance on the one machine in the entire casino that allows a bet as high as $100. Most of the 1,250 slot machines take $1 and $5 bets. But fresh off an early-morning round of golf and lunch at the casino’s fancy seafood restaurant, Umbruglia described his slot loss as one little blip in an otherwise fun day out with the boys. 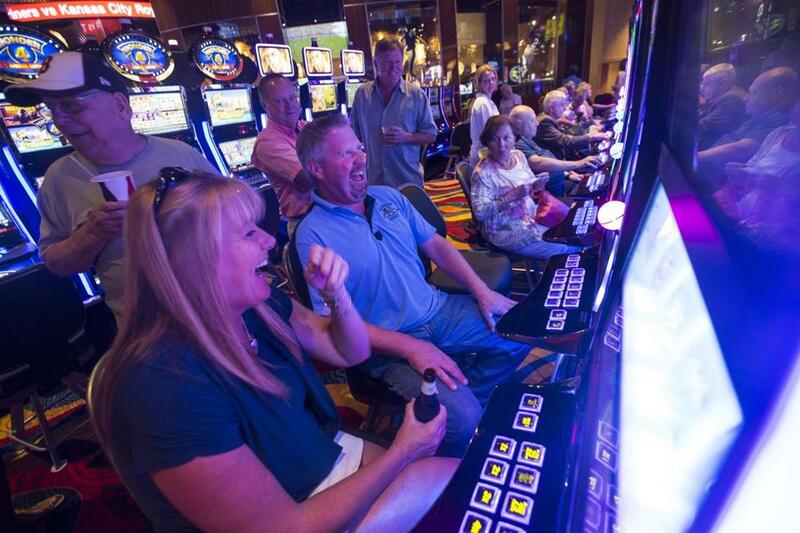 The Plainville slot parlor opening Wednesday follows decades of deliberation and offers a glimpse of the future — for better or worse. “It’s been a great time,” said Umbruglia, 52, of Stoneham, as he headed off to the video blackjack machines. Umbruglia was one of the hundreds of construction contractors who worked on the $225 million facility who were invited. Others included regular gamblers at Foxwoods and Mohegan Sun, the two Connecticut casinos, whose names appear on gambling databases. On Monday evening, about 1,000 “high-rollers” were expected to run the facility through its paces again during a four-hour, by-invitation-only session. By late afternoon, Plainridge general manager Lance George reported only minor problems. “The restaurants stressed out at lunch time, in the kitchens and in seating people, but that’s a minor stumble,” he said. The machines performed beautifully, he said. “We are certainly optimistic about opening for real on Wednesday,” he said. 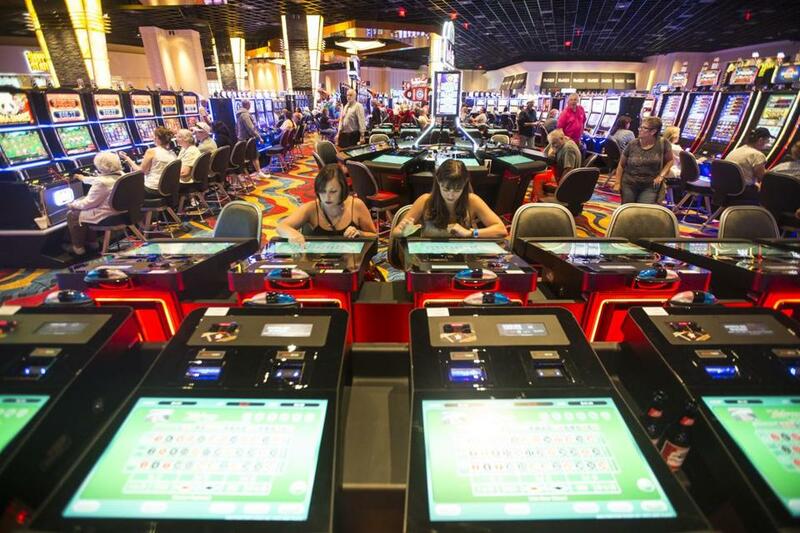 The state Gaming Commission also expressed satisfaction, though a final decision to let Plainridge open would not be made until later Tuesday. Gayle Cameron, a commission member, prowled the casino floor along with a small platoon of State Police and gambling agents looking for any lapses in the thousands of regulations that apply to the casino. The commission discovered that a door that was supposed to be locked for security reasons was open, she said. And the crew operating the hidden surveillance cameras seemed less-than seamless when switching from camera to camera to keep watch on an individual walking through the casino, she said. “Little things, mostly, that can be resolved,” she said of the dress rehearsal. The playing floor at Plainridge. On Tuesday, Plainridge will be tested again, though this time without players involved. The focus will be on the handling of money, as casino employees empty cash boxes from the machines, take them to the cash room, then balance the day’s receipts. “It all has to reconcile,” Cameron said. James McHugh, another commission member, said Penn National, the casino’s owner and operator, spent $250 million on the sleek new facility, about double the amount of investment required under the 2011 state casino law that legalizes Las Vegas-style gambling. 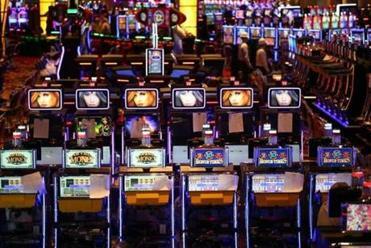 The state’s first casino is located about 35 miles south of Boston. “That’s a big investment and it shows,” he said, standing near the bar while a rock band belted out songs from a raised stage. Almost 500 people have been hired, including Jonathan Medina, 31, an assistant manager of slots. He has two children under age 7 at home. After working in the casino industry for almost 10 years on the West Coast, Medina said, he jumped at the chance to return to his native state. “I’m home now,” he said. Not everyone was thrilled with Plainridge. In the elevator to the parking garage, Esther Crowley, 72, and her two companions wrinkled their noses a bit. They had driven down from Concord, N.H., but were not planning to return directly home. “We’re going to Foxwoods,” she said.